Think light when it comes to eating on the road (or in the air). Staying hydrated is important while traveling but hardly anyone does it enough, partly because they don’t want to make bathroom stops if they’re driving, or use the airplane lavatory if they’re flying. If you want to avoid frequent bathroom stops, eat foods with high water content such as fruits and vegetables. Little containers of fruit are easy to find in airports and service areas—if you can steer yourself away from the doughnuts and the cinnamon buns. Fruits and vegetables are also lighter on the digestive system, which is a real boon if you’re sitting in a car for hours on end or, even worse, flying. In a plane, your body’s various systems have to work extra hard to deal with the low humidity and keep you functioning normally. Your body needs friends, not foes, in these instances, so skip the salty and sugary snacks. They’ll only mess with your hydration and energy levels. If you’re really worried about too many pit stops, hydrate as much as you can in the hours before you depart. Think twice about snacking. Do you snack because you’re really hungry or just because you’re bored? Thanks to the food industry’s marketing, we’ve become a nation of snackers. Eating between meals may stop you from fully digesting your food and burning fat. Mindless eating—in the car, on a plane, or in front of a TV screen—can cause you to consume up to 30 percent more calories, which are likely to convert into extra pounds. Travel may be a convenient excuse to avoid exercise, but it’s not necessarily the smartest excuse. 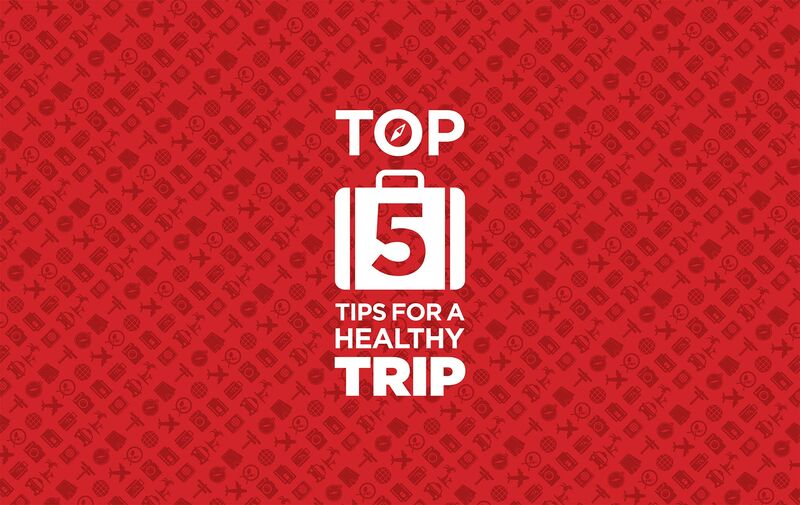 While you’re in transit, chances are you’re sitting scrunched up in a car or on an airplane, so it’s extremely important to get your circulation going at the first opportunity. If you don’t have time for a full workout, take a brisk walk, even if it’s around the airport terminal or around the block when you get to your destination. Spinal compression may occur after remaining seated for too long. This can lead to back pain, sciatica, and other issues. It’s very important, therefore, to stretch frequently. Combining stretching with core strength exercises will improve posture so that you don’t slump and cause compression. This will help mitigate lower back problems and make you look slimmer. Strange beds, lights, and noises all interrupt regular sleep patterns. In turn, lack of sleep makes it harder to stick to a healthy regimen. When you wake up tired rather than refreshed, you’re more likely to reach for caffeine and sugar to get you through the day. This can create a self-perpetuating yo-yo of energy highs and lows. Your first investment should be a good-quality eye mask. Jayne McAllister Travel Wellness recommends the Lewis N. Clark Comfort Eye Mask ($6). Whatever mask you get, it’s got to be big enough to block out cabin lights in airplanes and TV and clock lights in hotel rooms. Earplugs are another necessity: they eliminate background noises like fellow passengers on aircraft and elevators, ice machines, and in-room refrigerators in hotels. Make sure you’re warm enough. If you’re flying in coach, carry a shawl or light blanket to keep you warm. Airplanes can be extremely cold. Avoid taking sleeping pills, whether natural or prescribed. Your body will produce melatonin—the hormone that initiates sleep—if you follow the recommendations above. You can also eat melatonin-rich foods like pineapples, bananas, oranges, oats, sweet corn, rice, tomatoes, and barley. Understand what makes you frazzled about traveling so you can preempt it. By planning what you will do to handle a stressful situation—perhaps a flight delay or the loss of luggage—you can take control of the situation. Travelers tend to stress out when they don’t feel in control. Something as basic as planning how you might spend your time at the airport if you’re delayed will make a huge difference to how you react if that eventuality occurs. No matter what the purpose of your trip, schedule some time for yourself, away from others. It might be a soak in a tub, closing your eyes and meditating while the plane is landing, or unplugging all your devices and taking a ten-minute nap. Give yourself the time to recharge your batteries. Germs can be found on airplane tray tables and armrests. Wipe them down when you sit down. Start the day right. Rushing and avoiding breakfast sets you up for a fall. The body feels stressed if it doesn’t receive food within an hour of rising. Stress means more cortisol, which has four times the receptors in the abdomen, leading to belly fat. That said, beware sugar-laden cereal, juices, and bread products. A breakfast of fruit, oatmeal, or eggs with sautéed veggies, especially spinach, is a great way to start the day. If you do fall off the wagon, brush yourself off and move on. Beating yourself up will only lead to a sense of failure and possibly the temptation to throw in the towel. Remember it was only one meal and it’s what you do all week that counts.